Women who elect not to undergo reconstructive surgery following a mastectomy can use breast forms to help them regain their natural shape. Breast forms allow women to retain the look and feel of natural breasts when clothed. They help breast cancer survivors adjust after surgery and feel more comfortable and confident. What are Leisure Breast Forms? Breast forms come in a range of options, including silicone breast forms for everyday wear and waterproof swim forms for swimsuit season. For the times you want to kick back and relax, however, leisure breast forms are a great option. Leisure breast forms are great for sleeping or spending time at home, as they fill out the pockets of mastectomy nightwear, and loungewear nicely. They also distribute weight across your chest more evenly and provide a comfortable sleeping position on both sides of the body. 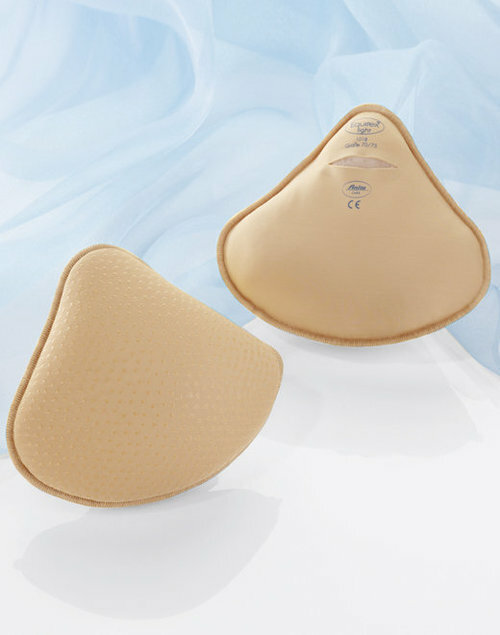 Leisure breast forms use super-lightweight foam covered in an ultra-soft fabric that does not irritate the skin. They are machine washable for ease of care. Leisure breast forms come in a range of shapes and sizes to suit women’s bodies of all types. Select the style closest to your natural shape to experience the best fit and comfort. At MastectomyShop.com, we want you to look and feel great no matter what you are doing. To achieve that goal, we carry a wide range of leisure breast forms. For women who prefer slightly weighted leisure breast forms, try the microbead forms from ABC. For superior comfort, use leisure forms from Anita, which feature an ultra-soft microfiber cover that’s kind on sensitive skin. It also helps to wick away moisture to avoid irritation and keep you cool while sleeping. For quality post-mastectomy breast forms, Bras, swimsuits, and more call us today.